A group of 16 male swimmers and four coaches are on their way to the Trinidad National Aquatic Centre for an important development opportunity geared towards building Swimming Canada’s next great men’s team. Under the leadership of National Development Coach Ken McKinnon, who will serve as Team Leader, and Senior Coach, Olympic Program Martyn Wilby, who will act as head coach, the group will spend a week in the warm weather training and growing as potential future Team Canada teammates. Olympic champion Mark Tewksbury, now an accomplished speaker and leadership trainer, will join the group for the first three days and lead a variety of mentorship exercises. It’s another targeted effort focused on rebuilding the men’s team, which is in a transition phase after the retirements of Olympic medallists Ryan Cochrane and Brent Hayden. Last year’s initiatives included targeted opportunities on the Mare Nostrum tour, and junior and senior relay and team-building camps. “This is about team-building for the males of the future and how they can come together the next three years and take a real shot at moving the men’s team forward for 2020. We’ll talk about the hardiness and toughness in training that’s required to get there, as well as doing things correctly,” McKinnon said. “This camp is very important for Swimming Canada in the development of our male program. Ken and Martyn will lead this camp and work with the athletes and their coaches about transitioning as a successful male junior swimmer into the senior team,” said Swimming Canada High Performance Director John Atkinson. “We are also delighted to have Mark Tewksbury attend this camp to work as a mentor with the athletes, coaches and staff. His special insights will be so valuable and we thank him for his involvement. Tewksbury will lead a workshop activity before the first workout on Super Bowl Sunday. “After that we’ll go swim, a sharp start with high volume, then come back and watch the Super Bowl together,” McKinnon said. The swimmers range in age from 14 to 17 and have been identified through Swimming Canada’s World Class On Track Times, which have been developed to better define development pathways for swimmers leading to potential Olympic podium performances. The group includes swimmers who put themselves on the radar including Cole Pratt of Calgary’s Cascade Swim Club, Finlay Knox of Foothills Stingrays in Alberta, Graysen Bernard of Toronto Swim Club/Ontario Swimming Academy, Gabe Mastromatteo of Kenora (Ont.) Swimming Sharks/Ontario Swimming Academy, and Joshua Liendo of Toronto’s North York Aquatic Club, a former Trinidad resident. “I know a lot of the guys going and I’m looking forward to seeing how they train. It’s going to be fun,” Liendo said. The coaches in attendance will be Don Burton of Ontario Swimming Academy, Mark Bottrill of Hyack Swim Club (New Westminster, B.C. ), Wendy Johnson of Cascade, and Marta Belsh of the Fredericton Aquanauts Swim Team. “It’s going to be a challenging camp. I’m expecting to learn from this group of younger athletes how keen and tough they are, and see who’s going to develop into the leaders of the group,” Burton said. “We need to identify and invest in this core group of athletes and give them the time to build a nucleus so they feel responsible to each other and part of the future of Canadian male swimming. Angel put down 3 best times and medal at university provincials, also did 2 National qualifying times (50,100 fly). Following on the large contingent of club and university teams that utilized the swimming and diving facilities at the National Aquatic Centre (NAC) in December and earlier this month, the Canadian national team also used the Couva centre as its base for the past week. The junior national swim team of 16 athletes and six coaches arrived on February 4 to conduct an intensive training sessions. According to team coach Don Burton, the group is being primed to represent their country at the 2024 Olympic Games, a hint of the long-term preparation by the Canadians when developing a national programme. Included in the contingent is Mark Tewsbury, a 1992 Olympic gold medallist in the 100m Backstroke, who is working with the team as a consultant. The team departed Piarco yesterday, just before the Carnival celebrations get into full swing and according to reports, they have had an enjoyable stay. They are expected to make return trip in the future. The Aquatic Centre was a hub of activity in the winter months, owing to the efforts of the Sports Company of T&T to position the facility as an ideal destination for winter training. Canadian University championships , not the same hype or range of talent as US university finals. Yet at least 2 Trinis -Seahawks will be trying for finals, and hoping for a medal. 1 in his first year-Angel, and the other in his final year - J Ramkisson. Unfortunately MzTing only doing 2 individual events (Flys',ranked 28th & 7th) although she has free standards as well, as she needed for all 5 relays, and only allowed to have 7 swims. swim dem dong MzTing, good luck with the NCAA standards. Lilman at Atlanta Grandprix, highest rank is 24th, lowest 52 nd. Hope he don't come home to vex. Swima, why bother go a major meet(with Pros at that) like this not fully prepared. i.e. untapered , un shaved , non-racing suit etc..yuh know yuh will get licks and add time, so why go so far to do that ? After all these years I still don't get it. It also bothers this swimmer, and we have to try and justify some reasoning, once in awhile, i understand, but it's an expensive lesson in training and humility. Thoughts, excuses i can use ! add: just saw he added 1.82 secs in 100 fly, probably won't make the D final with that, as he needed to do his best to make even that. maxg, are your kids swimming for TT in the Carifta swim meet around Easter? a lot would have to change on the reppin TT level doh, might, by that time. Don't think we can afford to pay for the kids to rep TT again. Busy affording them an education and hopefully a career. Contrary to popular belief, don't have that much scholarships in swimming. In Canada, barely covers 1/8 of school cost, if he go to the states, may get at least tuition, but the state of that nation, not sure I want to send a strong, respectful but social naive black boy there right now..Angel however got an academic that covers most of his tuition right here in our town. I hear you Breds! You did your part, and still doing more. Good luck and God Bless! Pysch sheets up, best ranking 8, lowest 18 th(last). just hoping for a pb, to take him outta the funk. Although their relay team collected the bronze in the 4 x 200, Lilman was quite disappointed in his leg. He was 3 secs slower than his pb. Couldn't sleep last night and started the quitting talk. This morning I say that not happening, as a proper dad, I not allowing that. I already made that mistake, and spent the rest of my life wondering if..so he better get that off his mind. He humbled and went off to the pool. Ranked last in his event today. Take yuh licks and try to improve, man. Feeling a little better, close to pb in 200 free, placed 15th. 17 th in 50 fly (26.12), he knew he was to slow. Again no pb in 100 fly (56.12), but won the B final. Did a pb in 200 fly (2.04.42 New TT record ? ), placed 7th. Lost position as top dog in 200 fly in club, younger teammate did 2.03.68, but was happy he finally did a pb. Picked up a relay bronze and gold, for 4x100 free and medley, respectively. Helping our club win the National banner. Next weekend Eastern Canada championships. Why Nationals before Easterns ? Anyway, hoping to improve on some sprints. 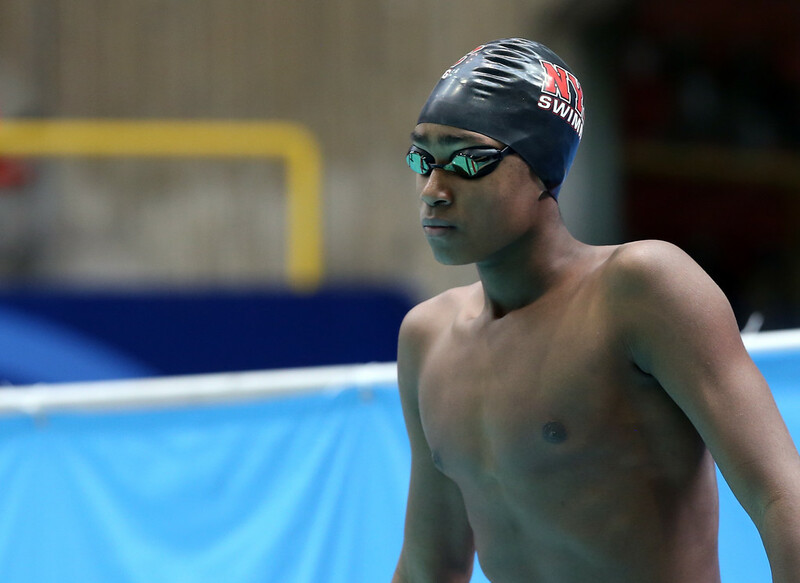 ps: Joshua Liendo, the outstanding Trini born 15 year old i mentioned earlier, selected to Canada's Jnr Pan-Pacs and I think 2018 Youth Olympic teams. Lilman say he is a very nice kid, unfortunately I didn't get a chance to congratulate him and let him know we will be supporting him all the way. Gabe MastroMatteo(breaststroke), one of the selected kids for PanPacs, finals-entry song selection as top qualifier, was Kes- Hello. Remember they had the camp in TT. The following team will represent Trinidad and Tobago at the CCCAN Swimming Championships in Aruba from June 29 – July 3rd. The teams were originally set to be confirmed on Tuesday after being proposed by the Swimming Committee. However the council meeting which was to immediately follow the swimming committee meeting did not have a quorum. Those council members present stated their agreement to the proposed swimming team, and the teams for the 3K and 5K open water swim, and the secretary was advised to initiate a round robin to get the requisite numbers to ensure a quorum of votes was had to ratify the team. With the council meeting being aborted, a new meeting was scheduled and held on Saturday at 9:30am. The secretary announced the result of the round robin where the aforementioned teams were ratified at the said Saturday meeting today. At this meeting, the council voted that the 10k open water swim team be ratified as per the results of the open water trial held two weeks prior. The swimming committee recommended that the team not be considered as there was a referee’s report that stated that the trial held for the meet was not 10k. It was stated that the race buoys shifted due to currents and altered the distance of the course. After vibrant discussion, it was agreed by the majority at council that the CCCAN Open Water 10k should be ratified as the athletes were required to achieve a place and not a time, and the selected athletes completed the course and should not be faulted due to external factors. The above named team was ratified in its entirety by council. To represent TT is suddenly becoming quite costly for our foreign born Nationals, due to circumstances beyond our control. It is the uncertainty of changing arrangements in a generation of unkept promises seem to be the underlying issue. Will maintain our commitment to training, preparation and availability to the sport as long as we can. However, if Canada ever calls in their investment, tough decisions will have to be made. Better athletes than us, getting jam still, so who is we. Four swimmers have withdrawn from the Trinidad and Tobago squad for the Central American and Caribbean Swimming Confederation (CCCAN) Swimming and Open Water Championships, to be hosted in Aruba from June 26-July 6, a tour expected to be funded by parents to the tune of over $10,000 per swimmer. And the Sport Company of Trinidad and Tobago (Sportt) cited a lack of funds and ASATT’s incomplete compliance to Sportt policy as reasons for not funding the CCCAN squad. Congrats to Dylan (new CAC record) and Kyle(new 15-17 National SC 100 fly record and) 15-17 National LC 200 fly record, also at CAC, previously held by lilman. Unfortunately Wikipedia doesn't consider Lilman a TT swimmer anymore and has also given Kyle the Open 200 fly record as well. I wonder if ASATT feels the same way. Poor lilman having a tough year all round (injuries and now being dropped and dissed), hope he can bounce back next year. If not, still proud of you son. This year in the books..
MzTing final year. Lots to work on. Apparently MzTing trying to get on the next CCCan team. Hope she saving her money. Lilman last club meet,before going of to University in Calgary. Lil swimmers are all grown and will have flown the coup. Thanks to those who have helped and supported us. We'ave come a long way baby. Congrats to Dylan Carter. Bronze in the 50. in the World championship in China. Don't forget, Dylan's 34 th in 50 free, Cadell Lyon placing 36 th in the 200 back, and 37 th in 100 fly. Great acomplishments as well. well represented. Imaxg, I hope this augurs well for the future. We need a good 6 to 8 personel in in both men and women to be competitive in international meet. TT swimming have to figure out a way to get funds for the swimming programs. Deeks, regarding Joshua, there is no way he wouldn’t be swimming for Canada, besides it the home he knows most. TT swimming in a worse off position than football, especially with even greater inadequate funding. As a matter of fact compared to any other sports, probably received the least per international representation and participation. At every level staff and participation(athletes) is 90 + % volunteers. You can’t get team coming out of that scenario, given the current TT attitudes. If you not best in the world, sorry we can’t help you. Ppl and potential athletes and parents dun read the scenario, so if support doesn’t come from outside, not gonna happen. Expect the other islands to move past us , even if they have less numbers.